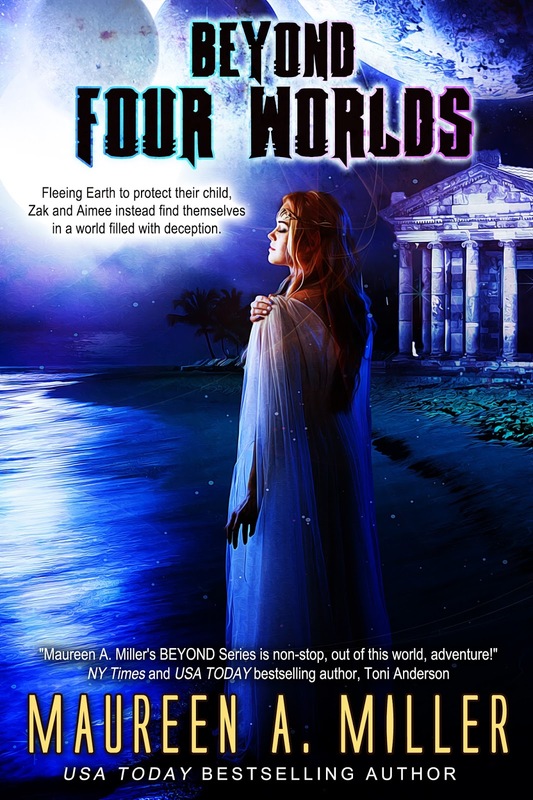 Four Worlds is the fourth and final book in the BEYOND series. Zak and Aimee are expecting a child. Fearful of the doctors on Earth detecting any genetic anomalies, they return to the safety of the Guardianship Horus where this unique toddler will be welcomed without question. Upon arrival, however, they learn that the Horus is not as safe as they anticipated. The massive craft is deteriorating, its structure crumbling after a series of celestial hits. Quite simply, the Horus must land…and fast. Anthum. A planet so lush, so serene, dotted with grand temples and sparkling shoreline. This was the planet the citizens of the Guardianship Horus fled from after an epidemic. Once the virus was eliminated, they were able to return to the pristine land they once called home. Anthum isn't as pristine as their memories portray, though. Yes, it still looks beautiful, but it harbors secrets. Secrets that can force these settlers back into being nomads. The young warrior, Gordeelum, crash lands in a valley high in the mountains. He is taken hostage by the citizens of that valley, and is given a grim sentence. His only hope is that his enemy can become his ally. Fleeing Earth to protect their child, Zak and Aimee instead find themselves in a land filled with deception. Will they survive this fourth world?